William Hayward Wilson was born on February 9, 1956 in Bamberg, South Carolina. He earned his nickname as a small child when he couldn’t say the word milk, instead saying mook. He credits his high school coach at South Carolina for teaching him how to be a pro ball player. 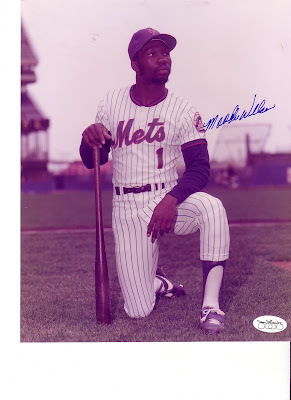 He then attended the University of South Carolina, and was drafted by the New York Mets in the second round of the 1977 draft. He spent four years in the minors, hitting over .290 with double figures in triples three times stealing over 49 bases twice. On June 22nd, 1978 Wilson got married at home plate at Smith Willis Stadium in Jackson Mississippi. A crowd of 1200 was on hand as Wilson & his wife walked through an archway of bats during the procession. After the game the crowd was invited on the field to the ceremony as cake was passed out to all. In 1979 at AAA Tidewater Wilson stole 49 bases and followed that up with 50 steals and a .295 average in 1980. The switch hitting centerfielder didn't have a strong throwing arm, but had great speed, which helped him get to balls quickly in the outfield. He was a good base stealer and always seemed to have a positive attitude. Wilson would soon become a Shea Stadium favorite, as the fans would always chant “Moooooook” when he came to bat. Mookie made his ML debut on September 2nd 1980 batting leadoff & playing centerfield at Dodger Stadium going 0-4, getting credit for an RBI on a ground out. On September 5th he stole his first base & would steal seven more the rest of the month. That month he also had three games where he would have three or more hits in a game. In 27 games he batted .248 (26-105) with seven steals & four RBIs. 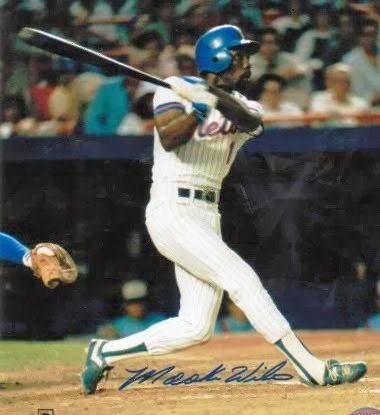 In the strike shortened 1981 season he was in the Mets outfield with Lee Mazzilli, Elis Valentine & Rusty Staub as the teams main centerfielder. At first he struggled, not hitting much the first two months. On May 29th he had a four hit game, against the Chicago Cubs, then added seven more multi hit games over the next two weeks. When the baseball strike hit in mid June he had brought his average up to .288. Play resumed in August & on the 25th he hit a top of the 9th inning game winning HR in Houston off future Met; Joe Sambito. On September 20th he thrilled the fans at Shea Stadium when he hit a two run walk off 9th inning HR off the St. Louis Cardinals relief ace Bruce Sutter. Mookie impressed everyone stealing 24 bases (8th in the NL) batting .271 with 8 triples 8 doubles three HRs & 49 runs scored in 92 games. He also learned a personal lesson that season in game against the Chicago Cubs, when he lazily played a base hit to him in centerfield. The batter was non other than Bill Buckner, a top player with the Cubs at that time. After Mookie's lax play, Buckner took advantage & advanced to second base. Mookie was very embarrassed by his lack of effort and from that day on, made a personal promise to always hustle on every play. In 1982 he brought excitement to a ball club that had been down for the past six seasons. He got two hits, drew a walk, stole a base & scored a run in the Mets 7-2 Opening Day win at Philadelphia. Mookie would steal at least one base in his first five games, seven of his first ten. He displayed some power with HRs in consecutive games in mid April & then drove in a game winning run on April 17th. That day his 7th inning sac fly off Montreal's Ray Burris, scored Tom Veryzer with the winning run. He drove in a dozen runs in the leadoff spot in April as well as scoring a dozen runs that month. In May he stole ten more bases & was batting .300 into June. Starting on May 25th he drove in runs in four straight games, although New York lost three of them. Through June & July he wasn't hitting as much, maintaining a .280 average. From August 15 through August 27th he drove in ten runs with 19 hits. In Cincinnati on August 18th, he tripled with the bases loaded off pitcher Frank Pastore, but the Mets still lost 7-6. He gave the 16,000 Shea fans a little more excitement on September 26th, as he broke a 7th inning tie with a two run bases loaded single off former Met Tug McGraw. The runs helped Charlie Puleo & the Mets to a 6-4 win. 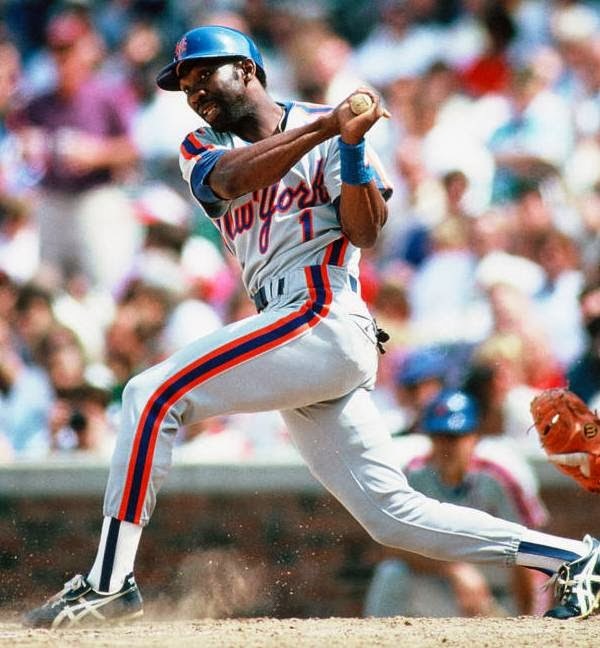 For the season he set a Mets record at the time with 58 stolen bases, also tying the club mark with nine triples. He led the team in runs scored (90) games (158) hits with a career high 178, batting average (.279) as well as extra base hits, total bases & at bats. In centerfield he led the league in put outs (421) making 12 assists which was second best in the league posting a .989 fielding % (3rd best in the NL). As the teams leadoff man he was striking out much too many times in the early part of his career. Wilson struck out over 100 times in both 1982 & 1983. By 1984 he struck out 90 times, but worked on his patience at the plate and lowered his strike out rates significantly by the mid eighties. In 1983 he began the year batting over .300 into mid May & when he got on base he stole bases. In the first two months of the year he had 16 stolen bases, by far leading any one on the Mets team, as well as being amongst the tops in the NL. On April 20th, he broke a 5-5 tie with a two run single off Pittsburgh’s Kent Tekulve, leading to a 7-5 Mets win. Wislon would hit safely in nine of ten games going into May. On May 26th his two run HR off Tim Lollar in the 6th inning, ended up being a game winner in a 3-2 win at San Diego. A summer slump saw his average bottom out at .240. On a late July road trip, he had some success; on July 20th he broke a 2-2 tie in Atlanta , with an RBI single off Donnie Moore in the top of the 8th inning. The run was the game winner. On July 26th he hit a walk off HR against pitcher Ken Dayley to beat the Atlanta Braves 2-1 in the 10th inning. In the final week of the month he had 14 hits & then followed up with a dozen multi hit games in August, getting his average up to .272. On September 17th, Mookie stole a season high three bases in a 7-6 loss to the Chicago Cubs at Shea. During the year he stole more than one base in a game, nine different times. Overall he had a good season, leading the NL in at bats (638) playing in 152 games. He led the club in stolen bases with 54 (4th best in the NL) run scored with 91 (8th in the NL) & singles with 138 (4th in the NL). Mookie batted .271 with a .300 on base %, 7 HRs 6 triples 25 doubles & 51 RBIs. 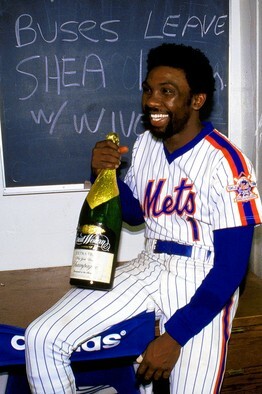 In 1984 he opened the season on a tear, starting with two hits on Opening Day in the Mets 8-1 loss at Cincinnati. That week he hit safely in his first six games, including a three hit game in Atlanta. He drove in two runs in the 6-1 win over the Braves & batted.400 in the first week of the month. In May he stole eleven bases and got his average back up to .300 by the start of June. He had a fifteen game hit streak in June, scoring seventeen runs & even hitting four HRs in the month as well. It was an exciting summer at Shea Stadium, as the Mets were in the pennant race for the first time since the mid seventies, chasing the Chicago Cubs. 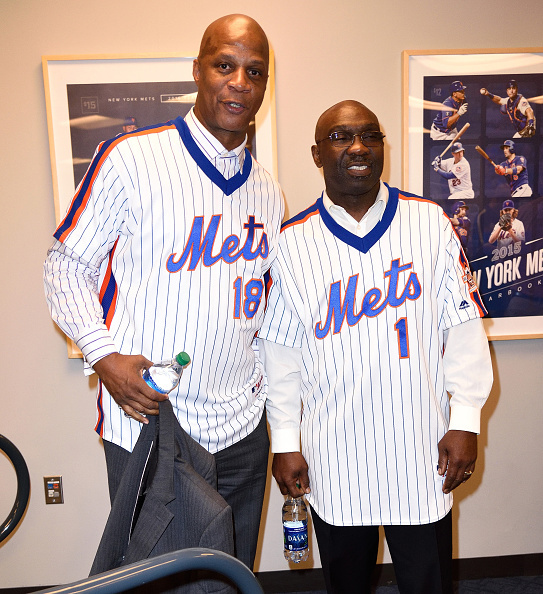 Rookie sensation Dwight Gooden was mesmerizing everyone with his outstanding pitching and slugger Daryl Strawberry was hitting some long HRs. For Mookie Wilson, he had been with the team during the early eighties in some dark times. He was now the veteran & mentor on good young ball club that was winning. 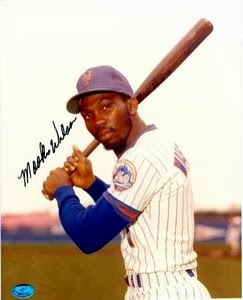 On July 7th at Shea Stadium, he hit a grand slam HR off Mario Soto & the Cincinnati Reds, in a Dwight Gooden 14-4 victory. Later on September 18th he had big three run double, off the Phillies John Denny, clearing the bases & tying up the game. He would walk & score in the 9th inning, on Daryl Strawberry’s three run game winning HR. On September 7th he had two hits & drove in three runs, in a big game against the first place Chicago Cubs at Shea Stadium. The Mets won the game 10-0 bringing them within six games of first place. On that historic night Dwight Gooden threw a one hit shutout, striking out eleven batters. Eventually the Mets would fall short of first place, finishing second to the Cubs by six & a half games. That year Mookie enjoyed one of his best years at the plate. He batted .276 with a career highs in HRs (10) as well as triples (8th most in the NL) with ten. He also hit 28 doubles (the most in his Mets career) scoring 88 runs playing in 154 games & stealing 46 bases (7th in the NL). In centerfield his .990 fielding% was third best in the league, as he only made four errors & had nine assists. He led all center fielders making six double plays. In 1985 he began the year as the teams staring centerfielder, getting two hits with a pair of stolen bases & a run scored on Opening Day. There was lot of hope & excitement with the Mets as the season began. On Opening Day, the newest star Mets player, Gary Carter won the game with a walk off HR. Wilson bashed out four multi hit games, in a five game April hit streak. 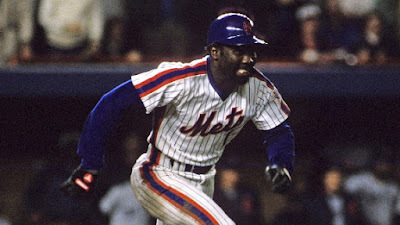 On May 29th, he began typical Mookie Wilson rally, contributing in the 8th inning with the Mets down 3-0 to the Giants in San Francisco. His hit scored Wally Backman with the first run. He advanced & then stole third base, scoring the second Mets run on a Gary Carter hit. New York went on to a 4-3 victory. On June 21st he had a big day in a 6-3 Mets win at Shea Stadium. In the 5th inning he had a bases loaded single, scoring two runs. He added a solo HR in the 7th & another RBI base hit in the 8th, defeating the Montreal Expos. On July 1st, he went down with a shoulder injury leading to him missing two months of action. The injury gave Lenny Dykstra an opportunity to play. Dykstra proved himself & from then on, manager Davey Johnson would use the two in a centerfield platoon system. He returned in September, hitting well enough to raise his final average ten points. He had four three hits games in the first two weeks of the month & nine multi hit games overall. On September 8th, with the score tied 1-1 to Orel Hershiser & the Los Angeles Dodgers, Wilson was at bat when Hershiser threw a wild pitch bringing home Rafael Santana. 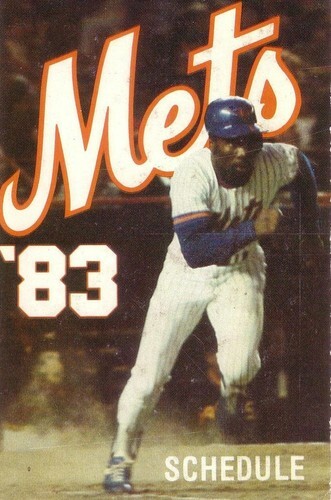 Mookie then reached on an error, stole second & scored on Keith Hernandez’s base hit as the Mets went on to a 4-3 win. In 93 games he batted .276 with 24 doubles, six HRs , eight triples, 26 RBIs & a .331 on base %.In the outfield he made eight errors in just 83 games for a .964 fielding %. In Spring Training 1986, he was hit in the eye by a Rafael Santana throw during an infielders drill. He suffered an eye injury as his glasses broke and he would miss the first month of the season. He suffered vision problems & would have trouble judging fly balls when he returned. The problem was especially affecting him during day games. He returned, on May 9th & in his second game back; he tripled & drove in a run in a 5-1 win over the Cincinnati Reds. He had a good West Coast road trip getting ten hits, including a five hit day in San Diego, on May 23rd. He tripled, doubled & drove in a two runs in the 7-4 loss to the Padres. In June he had seven multi hit games, and he hit HRs in consecutive games in mid June, in a pair of wins over the Pittsburgh Pirates. On August 9th his three run HR off Tim Burke, in Montreal proved to be a big factor in the 8-7 Mets win. He had a good August starting out by driving in runs in four straight games from August 4th though August 8th. In the first game of an August 6th double header at Wrigley Field, he stole two bases & drove in three runs leading the Mets to 7-6 win over the Cubs. Overall he had 31 hits, drove in 17 runs & stole eight bases raising his average over .300 in the month. 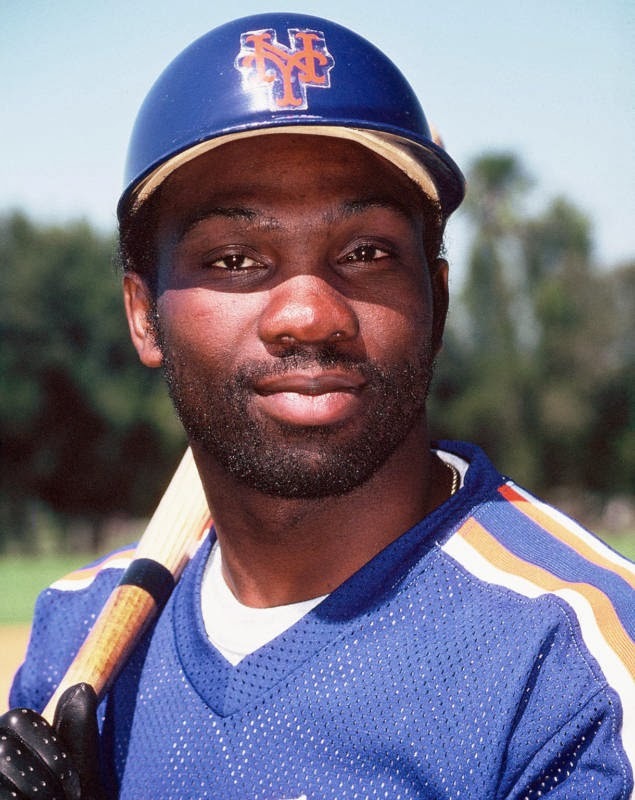 In the 1986 Mets Championship season he hit .289 overall with 25 stolen bases, 9 HRs 17 doubles 45 RBIs five triples & a .345 on base %. In the outfield he played 78 games in left field as well as 65 in center posting a .979 fielding % overall, making just five errors with seven assists. Post Season: 1986 NLCS: In the 1986 NLCS he only hit .115 against the Houston Astros pitching going 3-26 with an RBI. That RBI came in the classic Game #6 at Houston when he drove in the first Mets run in the 9th inning with a single scoring Lenny Dykstra. 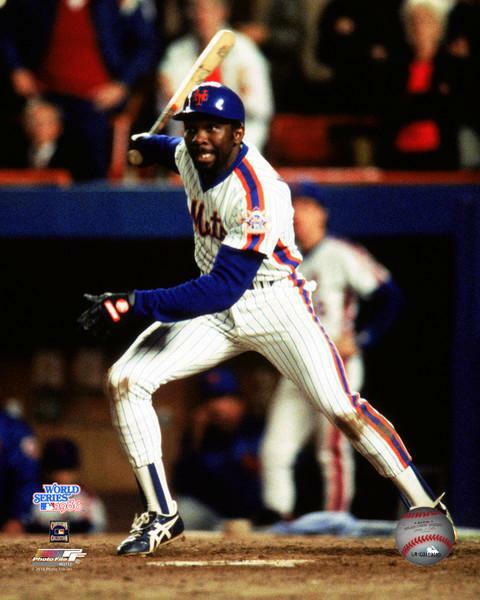 1986 WORLD SERIES: In the 1986 World Series against the Boston Red Sox, Mookie Wilson became a Mets legend forever etching his name in baseball history. He had one of the most famous at bats, during one of the biggest moments in Mets history. It came in the 10th inning of Game Six at Shea Stadium. The Mets were down to their final out, trailing the games & the series three games to two. Mookie came up with Kevin Mitchell & Ray Knight on base, with the Mets down by a run. Gary Carter had just scored on Ray Knight's single, Kevin Mitchell was the runner on third base & Ray Knight was aboard on first base. Red Sox manager John McNamara replaced pitcher Calvin Schiraldi, with the veteran Bob Stanley, to face Mookie Wilson. Wilson fouled three pitches off to stay alive, after seven pitches with a 2-2 count, Stanley threw an inside pitch in the dirt at Wilson’s feet. Mookie jumped out of the way to avoid getting hit and the ball went past catcher Rich Gedman for a wild pitch. Wilson hit the ground and waved on Kevin Mitchell to score from third base with the tying run. Meanwhile Knight moved up to second base. 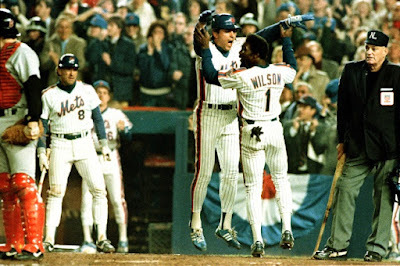 With centerfieldmaz in attendance, Shea Stadium was in pandemonium, literally rocking, as the Upper deck bounced, Wilson stepped back in with a full count. On the tenth pitch of the at-bat, he hit what is now a famous "little roller up along first base". It seemed to be an easy play for Boston’s Bill Buckner, but he was playing on two bad ankles. It got by Buckner, rolling under his legs and into right field. Ray Knight scored with winning run and Shea Stadium was absolute bedlam. People were hugging and kissing each other in utter amazement. Wilson quickly had jumped out of the batter’s box and is 100% sure he would have beaten Buckner to the bag, even if had fielded the ball. 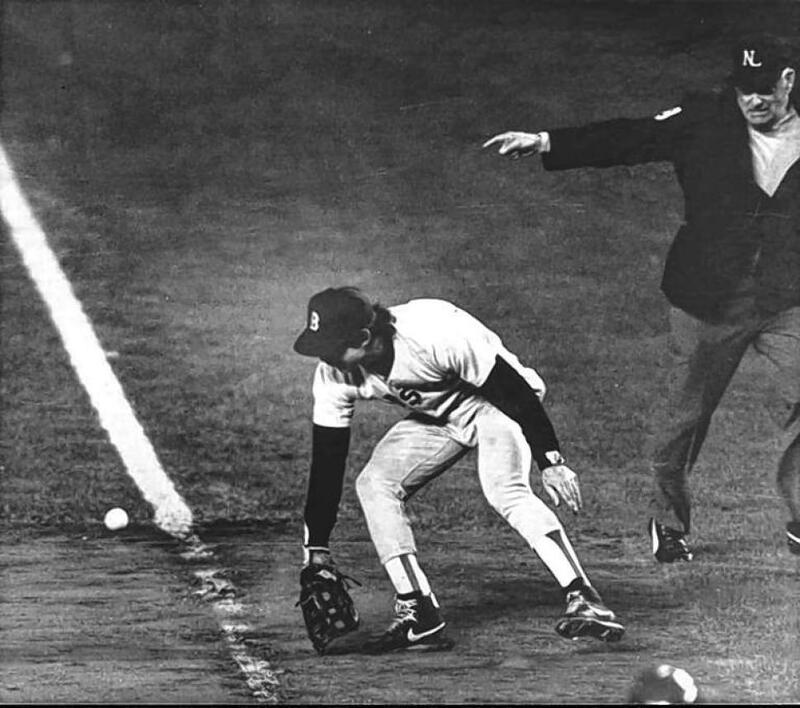 The play is one of the most famous comebacks in World Series history, and one of the Mets greatest moments. Wilson previously had a pair of hits in both Games Four & Five at Fenway Park. He hit safely in the final four World Series games. 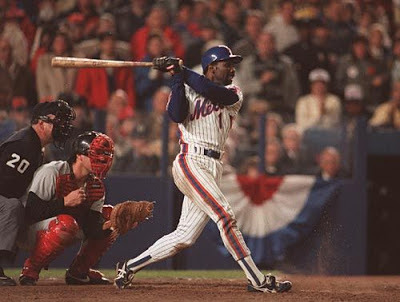 n the 6th inning of Game #7, Mookie got the second consecutive hit off Bruce Hurst with the Mets down 3-0. He would then score the second Mets run, when Keith Hernandez singled with the bases loaded bringing the Mets with in a run. In the 7th inning, Ray Knight led off with a tie breaking HR & the Mets went on to win the game as well as their second World Series. Quotes: Vin Scully's NBC call of the play would quickly become an iconic one to baseball fans, with the normally calm Scully growing increasingly excited: So the winning run is at second base, with two outs, three and two to Mookie Wilson. A little roller up along first... behind the bag! It gets through Buckner! Here comes Knight, and the Mets win it! By 1987 Wilson had become one of the Mets senior players and was an important role model through for the younger players. He began the season on a tear with to hits on Opening Day, and finishing April batting .375. He already had six multi hit games and stole four bases. He was consistent all season, never hitting below .285 and remaining over .300 for the majority of the season. He raised his average to a career best .299 by the end of the season with 21 steals, 9 HRs 19 doubles 7 triples 34 RBIs & a career best .359 on base %. In 109 games in the outfield he posted a .963 % and was seeing more time in left field (20 games) & right field (14 games). 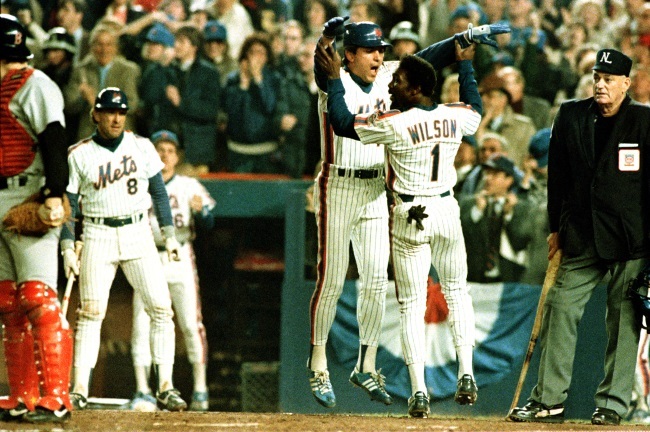 In the 1988 season, the Mets returned as NL Eastern Champions. On April 10th hit a pair of HRs against the Phillies on April 10th in Philadelphia leading the Mets to a 4-3 victory. He went on an eleven game hit streak going into May, and picked it right back up hitting safely in six of his next seven games. He went into a slump which saw him bottom out at a .234 average by August 1st. But Mookie battled back having hit streaks of seven, eight & six games into September. 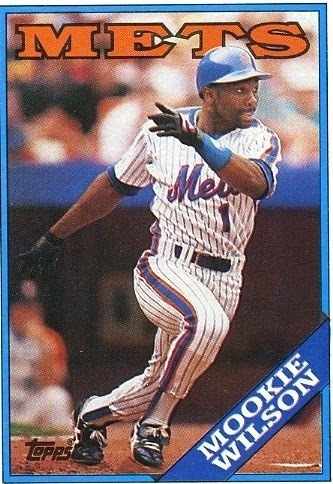 On September 2nd, Wilson hit a two run HR in an 8-0 win over the L.A. Dodgers at Shea Stadium. Three days later, on September 5th, he hit a three run HR, leading the Mets past the Pirates in Pittsburgh 7-5. Wilson followed with two more HRs in the month, adding ten multi hit games while bringing his average up to .296. on September 24th he had a three hit four RBI day in St. Louis. Then in that final month he hit safely in 18 of 21 games raising his average back up just under .300 at .296 to close out the year. As the Mets won the divisional title, Mookie's batting average was second best to Wally Backman’s .303. He had 112 hits with 17 doubles, five triples, eight HRs, 61 runs scored 41 RBIs & a .345 on base %. In the 1988 NLCS Wilson struggled, going only 2-15 with an RBI playing in four games, as the Mets lost to the Los Angeles. By 1989 the Mets had lost their faith in him, they traded away Lenny Dykstra & brought in Juan Samuel as the main centerfielder. That experiment didn’t last too long either, Samuel was gone after 86 games. Mookie was unhappy about seeing less playing time but still played hard. He was only hitting .205 with seven stolen bases, three HRs & 10 RBIs atfer 80 games. That July he was traded to the Toronto Blue Jays in July for Jeff Musselman & Mike Brady. The fans were upset and missed the popular Mookie, especially because Len Dykstra was gone too. 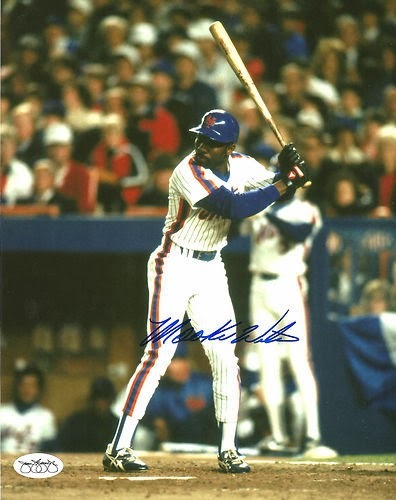 Mets Records: In his Mets career Mookie has played the most games in centerfield than any other Mets player (907). He is eighth all time in games played (1116). In Toronto he hit just under .300 in the final two months, and scored the winning run in the game that clinched the 1989 AL East Division. Post Season: In the ALCS he got five hits batting .263 against the Oakland A’s. In 1990 he hit.265 in his last full season as a regular with 3 HRs 51 RBIs & 21 stolen bases. He finished his career in Toronto getting to another post season in 1991 going 2-8 in the ALCS against the Minnesota Twins. 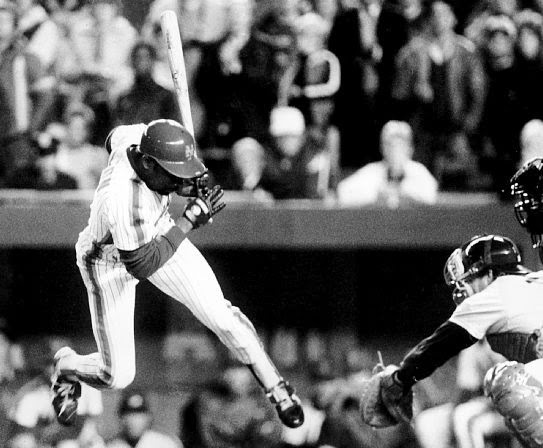 In his twelve season career Mookie played in 1403 games, batting .274 with 1397 hits, 327 stolen bases, 67 HRs 227 doubles 71 triples 448 RBIs 731 Runs scored & a .314 on base %. In the outfield he posted a .982 ielding % making just 58 errors in 3196 chances. He had 54 assists & turned 21 double plays. Family: He is the uncle and stepfather of former Met Preston Wilson. Mookie's brother is Preston's father, after he split up with Preston’s mother; Mookie married her & introduced the boy to baseball. 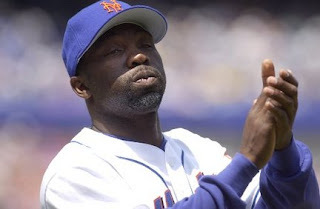 Retirement: After his playing career ended, Mookie Wilson returned to the Mets as the team's first base coach from 1996 to 2002. 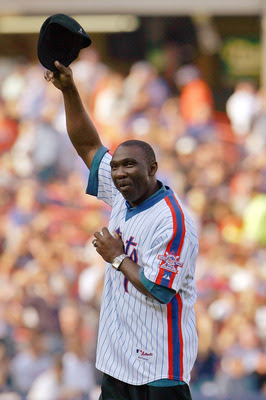 Once again he was one of the most popular figures in Mets history, in that role as well. Later in 1996, he earned a bachelor's degree from Mercy College in New York. In 1999 he got a license to drive tractor-trailer trucks and began hauling freight in the offseason, a job he said he always wanted to do. During that same time he recorded a gospel album. In 2003- 2004, he was manager of the minor league Kingsport Mets, and in 2005, he became manager of the single A Brooklyn Cyclones. After that he had a falling out with the organization, and refused an invitation to the closing ceremonies at Shea Stadium in 2008. Time heals all wounds & Mookie returned to the organization in 2010. He was once again a Mets coach for the 2011 season. Since 2012 he has worked in the Mets front office. In 2013 he managed the U.S. Team in the All Star Futures Game held at Citi Field. He was around town & at Fan Fest representing the Mets during All Star week as well. Honors: Wilson was inducted into the New York Mets Hall of Fame in 1996. 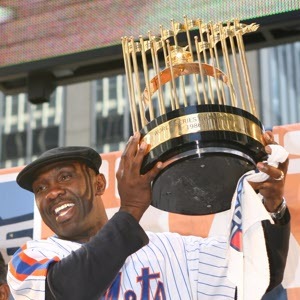 He was on hand for the 20th anniversary celebration of the 1986 Championship team in August 2006 & made a triumphant return after a few years of a falling out with the organization in 2016 for the 30th Anniversary at Citi Field. 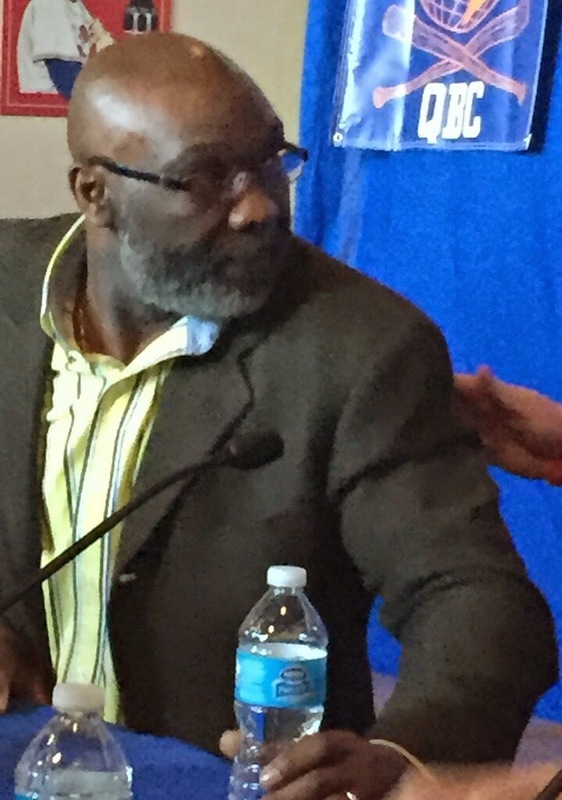 In 2015 he was one of the headlining Mets guests at the 2015 Queens Baseball Convention at McFadden's Citi Field. In 2016 he helped promote the Book Kings of Queens by Erik Sherman, with an appearance at the Yogi Berra Museum in Montclair New Jersey. Mookie is a long time resident of Lakewood, New Jersey. His family started an educational center there for girls, called Mookie's Roses.